The CaWE editor is included with the regular Cafu releases, and as such requires no explicit installation: After unzipping the packed file, simply change into the Cafu-x.y directory. Under Windows, then double-click on RunCaWE.bat. Under Linux, click CaWE-run in the Projects/Cafu/ sub-directory. This section is relevant to CaWE releases before February 2008 (version 8.02) only. If you have version 8.02 or newer, the initial setup is fully automatic and you can skip this section safely. You may still check out the Configure CaWE Options dialog anytime later. After clicking on OK, CaWE will automatically show you the related configuration dialog. Here, click on Add New for adding a new game configuration. You will then be asked for the desired name of the new config. You can enter anything here, i.e. normally something that reminds you what MOD this config is related to, like “Cafu DeathMatch”. Next you have to fill-in where the Game Data File is located. This is a file with .fgd suffix. One such file is already provided with the Cafu package: the DeathMatch.fgd file in the Projects/Cafu/Games/DeathMatch subdirectory. Click on the related Browse… button and locate the file. Finally, fill-in the rest of the dialog appropriately such that it eventually looks like this. The paths will of course be different for you, depending on where you installed the Cafu package and its version. See the next step however for an alternative setup. Alternatively to the previous step, you can also fill-in relative paths as shown in this image. This is the preferred method, because it works better with future versions of CaWE, makes upgrading to a newer version of Cafu and CaWE easier, solves some problems with map compilation some people were reporting, and will become the default with future releases of CaWE! Please note that under Linux, you have to use forward-slashes as the path separator (e.g. 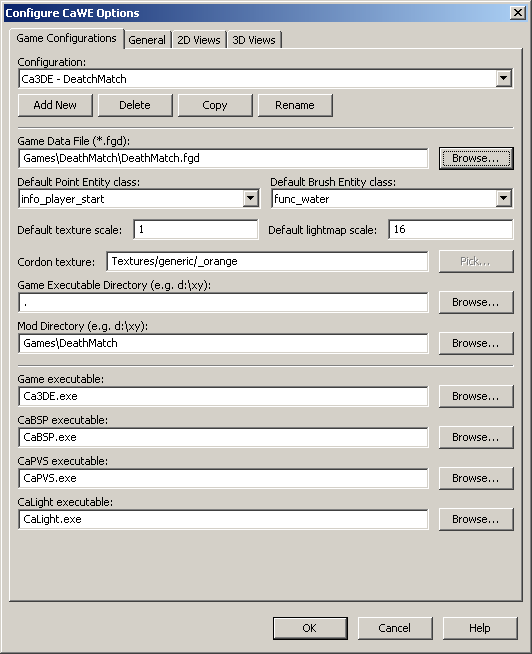 Games/DeathMatch) and executable files must be referred to like e.g. ./CaLight. All settings in this dialog can be revised later at any time via the File → Configure CaWE… menu. Adding new or additional game configurations at that time may however require to restart CaWE for the settings to take effect. CaWE, as all other Cafu related software, has been designed to interfere with your computer and operating system as little as possible. In general, it is enough to delete the directory that the packed file was unzipped to during installation, and all traces of CaWE are gone. There is one exception though: When run, CaWE stores your configuration settings in a newly created directory. This directory is located in the “home” directory of the current user. The exact place on your harddisk depends on your OS and even on its version, but CaWE states the full path to it both in the Configuration dialog (General tab), and in the About dialog box that is accessible via the Help → About menu.